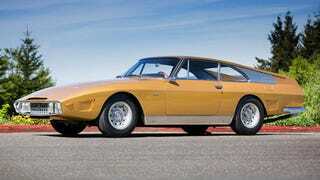 This is the Ferrari 330 2+2 Speciale; it is not the prettiest Ferrari in the world. It does have a V12 engine with a really long roof, and unlike a 250 GTO breadvan that would auction in the range of eleventy-billion dollars, this one is set to fetch between 400-600k at Pebble Beach. According to a 1972 article in Sports Car World, nightclub owner Robert Navarro was unhappy with the looks of his '66 330 GT 2+2. So he made a drawing of how wanted the car to look. The story goes that Navarro was friends with Piero Drogo of Carrozzeria Sports Cars, and was able to convince Drogo to take the design and remake the Ferrari. The result is car that is well beyond the classic lines of Pininfarina; it is almost futuristic. It is a car that reflects the wild concepts that toured the auto-shows of the time, yet never materialized. This car actually existed and was driven. It still retained the same 300hp V12 and made it to 60 in about 8 seconds. But this car isn't about displacement or horsepower, or even track specs...it is a testament to one man's unique vision on taking an already amazing car to another level. I'm of the philosophy that Ferraris should be left alone, but I have to respect man's quest to go to such lengths to make this car exactly how he envisioned. Considering there is no shortage of modern prancing horse owners who "alter" their cars with leather wraps, or obnoxious graphics, this 330 at least has some class.